The agency that oversees Wagner Park is set to replace the landscape, designed by Machado Silvetti and OLIN, with one it thinks will be more resilient. Now, in response to the specter of Hurricane Sandy and the threat of rising seas, the agency that oversees the area is planning a total park overhaul. 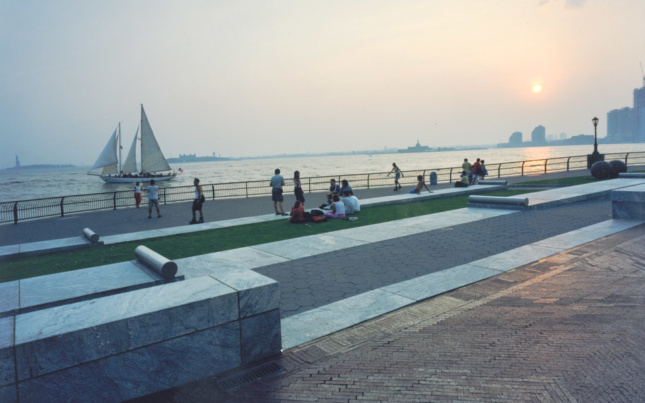 The Battery Park City Authority (BPCA) is set to replace the existing landscape that architects and residents love with a park it says will align better with new resiliency measures that are reshaping the Manhattan waterfront. That was written in a pre-Sandy time, when climate change was a glimmer only in scientists’ eyes. 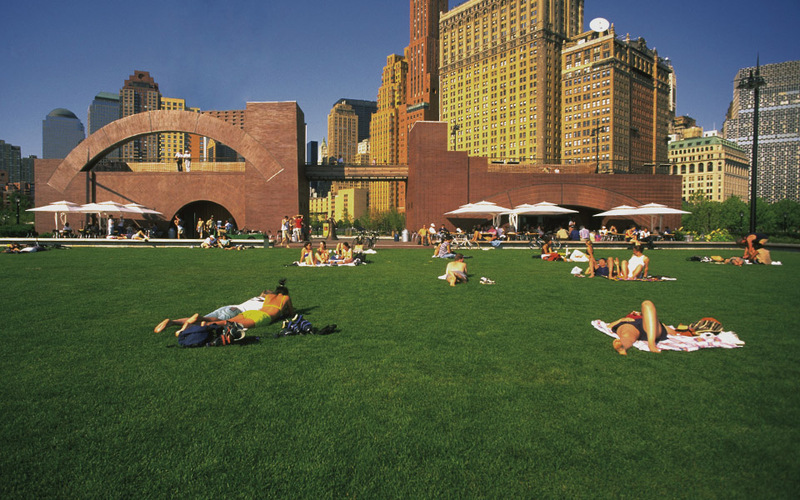 Now, the BPCA, the state agency in charge of Battery Park City, says Wagner Park needs a totally new design to protect itself, as well as inland areas. 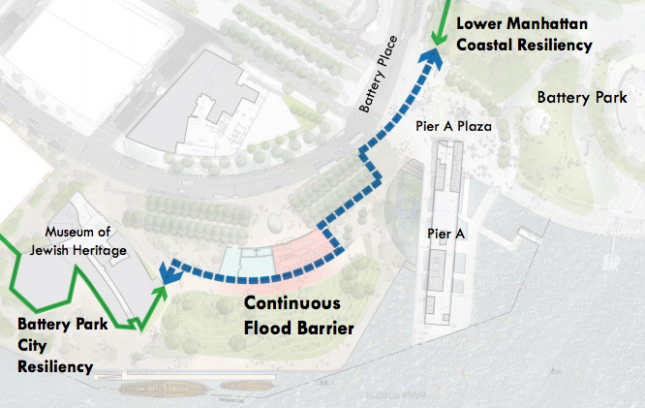 Though it didn’t flood during Sandy, hurricane-related inundation along nearby West Street and the area’s “excessive vulnerabilities” made the agency consider a storm barrier to align with the city’s Lower Manhattan Coastal Resiliency (LMCR) Project, said Gwen Dawson, vice president of real property at BPCA. 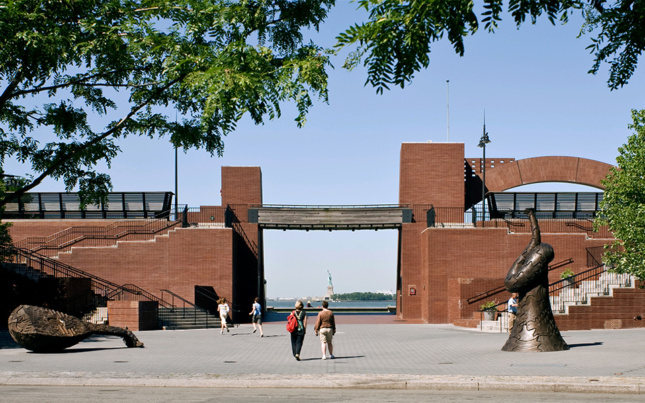 Right now, LMCR protections terminate right before Wagner Park’s southern boundary and the city’s Battery Park City resiliency initiatives end at the park’s north side, near the Museum of Jewish Heritage. 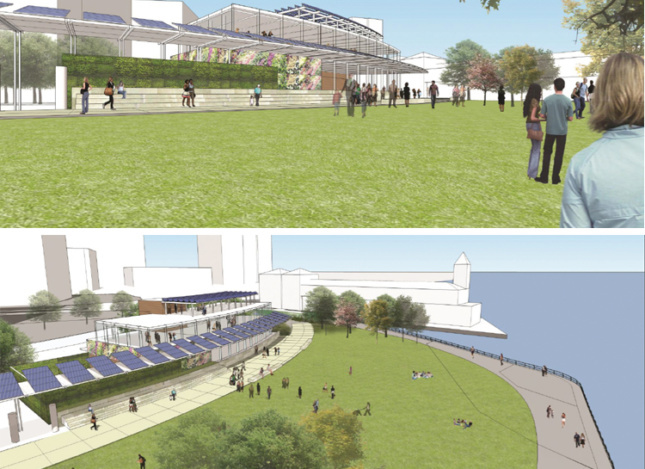 At the water’s edge, preliminary plans call for extending an existing esplanade to connect with nearby Pier A. To flood-proof inland areas, a deployable barrier set between thick columns would roughly contour the existing building’s footprint and the southern allée, while a larger lawn and ornamental gardens would replace the current configuration of wood benches and stonework. 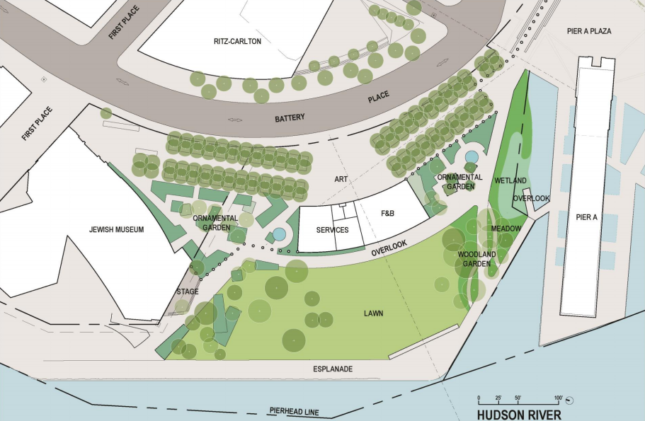 BPCA has commissioned Stan Eckstut of New York’s Perkins Eastman, the same architect behind the original Battery Park City master plan, to design the new building and park (in collaboration with W Architecture and Landscape Architecture). Besides the landscape’s vulnerability, Machado Silvetti’s building, BPCA says, is too deteriorated and set too deep into the 100-year floodplain to withstand future Sandys. At 12 feet, the structure’s first-floor elevation is four-and-a-half feet shy of new minimum first-floor flood zone elevations. Perkins Eastman’s design would keep the same footprint as the old building, but, at 42 feet tall, it would more than double the amount of retail space and add room for maintenance operations. The restrooms, which are bigger than those in Bryant Park, would be halved in size to deter tour buses from stopping at the park. Not everyone, though, thinks the BPCA’s approach—or design vision—fits the site. Starr—whose firm worked on the East Side Coastal Resiliency Project, a major initiative to build resiliency along the Manhattan side of the East River—contends that solutions to flooding should focus on Pier A’s plaza, where in 2012 seawater inundated main roads, the World Trade Center site, and the ballfields along West Street. She questioned whether the deployable barriers, which even at rest are very visible and do not go up automatically, would be the best solution. Instead, she believes built-in-place barriers that double as promenades, parks, bikeways, green space, and (in some cases) elevated roads are more effective from a holistic resiliency standpoint than deployable barriers that rely on an operations team to be effective and don’t contribute to the urban design. The original architect, too, is less than thrilled with the proposal. “The design premise is an insult to the Statue of Liberty,” said Rodolfo Machado, founding principal of Machado Silvetti. “This project seems totally non-site-specific; the symbolic content of the park is completely lost. It’s very banal.” He had not heard about the BPCA proposal until AN reached out for comment last week. Perkins Eastman principal Stan Eckstut maintained that Machado Silvetti’s design is sound, but added that the pavilion was not constructed for the restaurant that today occupies its ground floor. Water, though, has seeped through the bricks and built up inside the walls, causing deterioration. There’s also not enough space for maintenance operations, so the BPCA wants to add 1,800 square feet of space for maintenance, bringing the total to 4,300 square feet. The project’s budget has yet to be finalized, but it’s estimated it will cost tens of millions of dollars. The next step, BPCA officials said, is engineering and design, which includes the development of an RFP for a more detailed program that is set to come out within the next 90 days. Though this plan affects only a sliver of New York’s 520 miles of coastline, the rebuild-and-replace approach raises larger questions about the future of climate change design in New York City. At Machado’s suggestion, AN reached out to architects for comment on the proposed changes to Wagner Park and the future of resilient landscapes in New York. We’ll update readers as more comments come online. [It’s] unfortunate that there is a move to demolish these pavilions and replace them with structures that do not acknowledge the colossal scale at which pavilions would need to operate in relation to the NYC skyline, nor acknowledge the critical urbanistic connections to the Statue of Liberty…or the other more nuanced connections within Battery Park City. It might be that these pavilions, like many other structures and landscapes on the edge of Manhattan, would need to be revisited in terms of resilience, and their ability to absorb the cyclical fluctuations of a piece of infrastructure. But to deny them of the critical urbanistic function they offer is to deny NYC some of its paradigmatic qualities. At the end, rising tides will become a consistent challenge in the coming years. If at every turn, the alibi of impending doom is adopted as the basis for the demolition of critical values that make up the discipline of urbanism, then we will end up with a series of barriers (both physical and cultural) that deny us of engaging the very reasons we build urban cultures. I think the park has become a type of fixture in our downtown life. The design is a bit idiosyncratic but it is very well-detailed and there is something very endearing about the structure which takes into account multiple scales of elements occurring on the site from high rises downtown to the view of the harbor to the experience of park at human scale. In particular, the front esplanade is an excellent design, it makes for a beautiful transition from the building to the lawn. Its gentle arc and steps and stone details help negotiate this important edge in a very graceful manner. Isn’t it possible to leave it as is and let it flood like they do in Venice? Or take care of flooding issue in a less obtrusive manner? I would like to know more, especially regarding alternative ways of dealing with sea level rise that could preserve the Wagner Park structure by Machado Silvetti. Their design enhances an urban place that offers uniquely strong visual connections to the Statue of Liberty. They employed a powerful and erudite architectural vocabulary that elevates one’s appreciation for an appropriately monumental civic celebration and at the same time delightfully challenges one to ponder its mysterious formal origins.